If you're sick of slouching at your desk or at home, you've probably found that correcting yourself can be near impossible. However, with the help of wearable tech, you can improve your posture – and your health. With slouching and sitting often cited by medical professionals as the cause of a host of negative health effects, it pays to invest in support and keep tabs on what could turn into a bigger problem. So for anyone who's finally decided to do something about it, we've picked out the wearables to cast your eye over. Some are available to buy now and some are on the way. Any questions? Let us know in the comments section below. Upright already provided a solution for your lower back with its original posture trainer, and its second device aims to fix your upper back and neck form. Like its older sibling, the Upright Go has been designed to be a discreet solution to your niggles. 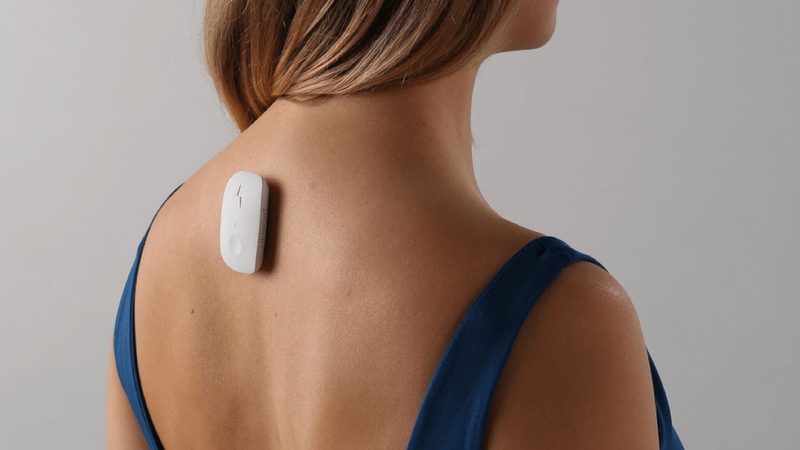 And once you've managed to develop enough flexibility to fix it onto your back, the device is able to track and train your posture by providing feedback on how to prevent aches and muscular pain. An avatar in the companion app gives you a live look at how you're leaning over, while also providing information on how many hours in the day you find yourself sitting around. The device already proved a success through Kickstarter and is now on sale for everyone looking to improve their chair habits. Have a read of our Upright Go review to find out what we made of it when we put it to the test. The Lumo Lift is comprised of a small, plastic oblong sensor designed to be worn just below the collarbone and as close to the body as possible (it might not work so well on loose clothing). The device is magnetic, so once in position – say, behind a tight-fitting T-shirt – it can be held there using the external magnetic clasp. Setting up involves standing up straight with shoulders back and double tapping the sensor to confirm. The Lift will buzz a gentle reminder whenever the wearer slumps back into a slouch. Of course, any body sensor can be programmed to monitor a number of functions, so this also measures steps taken and calories burned. Naturally, there's an iOS app for it too, but it's not really required unless you wish to know your progress in 'posture hours'. Courtesy of Sydney-based fashion tech startup Wearable X, these connected fitness tights are firmly focused on fixing posture for yoga fans. The connected garment uses haptic tech to provide gentle pulses at the hips, knees and ankles to encourage you to move and hold positions correctly. Syncing up to an app via Bluetooth, the pants communicates feedback to guide correct posture and to monitor form and alignment based on a range of user movement. The Nadi X tights come in four sizes – XS, S, M and L – and in four styles – Midnight, Midnight with mesh, Black/White with mesh and Navy/Gray with mesh. A new range for smart yoga pants for men is also set to be up for grabs too. Okay, it's not a wearable, but Darma provides a different approach to posture correction and we think it's worth mentioning. Rather than a wearable, brooch-style sensor, the Singapore-based startup's method instead monitors sitting behaviour using a sensor-equipped cushion. According to their scary stats, "Sedentary behaviour (measured by the time spent sitting) is linked to the risk of developing obesity, type 2 diabetes, cardiovascular diseases, metabolic syndrome or premature death." Mmm, that's reassuring. Their answer (aside from not sitting so much) is to plonk your bum on the world's first app-enabled smart cushion. The Darma memory-foam cushion monitors posture, sitting habits and stress levels and ports the data it gathers to an Android or iOS device. Given that many offices workers sit at the same desk every day, a system like this could be just the ticket for those who refuse to festoon themselves in wearable sensors. Austrian-based startup Stapptronics has taken posture tracking to the feet, with its smart insole that fits inside your shoe and enables the user to receive data on posture and gait analysis, weight measurements and even notifications regarding potential skeletal deformities. The team, which includes medical processionals in the field of podiatry, has spent roughly 18 months developing the idea into a working prototype. The Stappone smart insole completed successful Kickstarter and Indiegogo campaigns in 2018 and the wearable is expected to start shipping before the end of the year. Vitali's approach to posture is a little different from the others on the list. Rather than tell you how bad your posture is, the Vitali Everyday Smart Bra uses your posture to determine how stressed you are. The Smart Bra pools together your posture data with breathing rate and heart rate variability to determine your stress levels. The companion app will tell you, for instance, that your posture slips around 3pm, indicating that your stress is really picking up. You're then aware of that time period as a point of stress and can make adjustments. The bra is also built with ultimate comfort for women in mind, using the basics of a sports bra to build a comfortable wearable that not only works when running, but at a casual day at the office or on a day out. The launch has been delayed but is expected to finally land in 2018. This feature-packed bamboo pendant, made for men and women, houses a UV sensor and blue light sensor that along with motion sensors combine to help fix your form. Pose is able to use the angle of your chest to track your posture, which you can calibrate yourself whenever you need. It'll then vibrate to tell you that you need to sit, or stand, up straight. Opter raised just shy of $40,000 to make the Pose a reality. Having decided to give the tracker a redesign, though, it looks likely to ship a lot later than the estimated March delivery it had hoped for. I would have liked to see a review of the products. After pulling up the apps on Google Play for the Upright Go and Lumo Lift, it seems they have some major issues. At least on the Lumo reviews customer service responded so they seem to be making an effort to resolve issues. The Upright Go did not have much response from customer service.